What are the secondary colors in subtractive color mixing? The secondary colors for dyes and pigments are the same as the primary colors in additive color mixing. Red, green, and blue dyes or pigments reflect their own color while absorbing the other two colors. For example, red would reflect red but absorb the green and blue light. 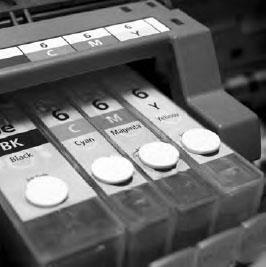 Color inkjet printers use black, along with yellow, cyan, and magenta, because the colored pigments do not cover the full spectrum. Therefore, they cannot produce a dark black but only a muddy dark brown.